Well as a woman we wear many hats all the time… as daughter, sister, wife, mother, friend, colleague, employee, housekeeper, and many more. Sometimes these hats are stacked so high, sometimes we could lost our balance and breakdown. Do take a break and reassess our life priorities because we have to take care of ourselves before taking care of others. I was at the A Women’s Journey Through Health with Menarini workshop last weekend to learn more about our overall well-being and empower us to take control of our life with adequate knowledge. This is an educational workshop for women only and all the topics discussed and activities were related to women; thus making it more conducive for the participants to share their experiences and also asked questions that they encountered. The first Health Talk was conducted by Dr. Ho Choon Moy, an Obstetrician & Gynaecologist at Pantai Cheras Hospital who is also a member of the Malaysia Menopause Society. Her topics of sharing and discussion was Women’s hormonal changes from her wonder years through golden years. How is it impact her emotionally and physically? Speaking about this topic, as a women we go through stages of our life from our Wonder Years to Golden Years. For those in their Wonder Years are young, active and productive. During this stage of life, most women are able to enjoy intimate relationship with their spouse or life partner. Well some are planning for parenthood but some are not ready yet. Therefore, unplanned pregnancy might lead to abortion which is illegal in Malaysia and dangerous for women. To avoid unwanted surprises or unintended pregnancy Dr. Ho shared with us there are many methods to prevent it such as traditional contraception, short term contraceptives, double dutch, oral contraceptive pills and many more. It was an eye-opener to know that contraceptive pills have more benefits in our health than just birth control. It can also helps to improve acne skin, reduce period pain, regulate of menstrual cycles, treatment of premenstrual syndrome (PMS) and many more. After the Wonder Years, then we moved on to our Golden Years. Menopause is a nightmare to most women, more of it if we are unprepared and don’t have the knowledge about what to expect. Are you afraid of menopause? Well, menopause is our final menstrual period, natural and inevitable that happens to women at the average age of 51 years old. Post-menopause happens 1 year after the last menstrual period, peri-menopause begins anytime from 40 years old onward until the beginning of post-menopause. Dr. Ho told us that women spent more than one-third of our life in the post-menopausal years. However, if we are equipped with knowledge about the symptoms of menopause and lead a healthy lifestyle we can enjoy our Golden Years such as eat healthy, regular exercise, reduce stress and be happy. Look at the positive side, menopause is a new beginning when we no longer suffer from PMS, our children had grown up, we are on our retirement age and finally we more have time for ourselves to enjoy life to the fullest. On that day, there are several educational topics that related to women’s health; booths were setup at the back of the ballroom for us to learn more and experience the products; various fun activities such as cycling, hair grooming, blend your own juices and many more. One of the participating booths is Menarini where they provide free analysis and also introduced their Papulex skincare range for acne skin. Atopiclair cream, a non-steroidal cream for eczema users that is suitable even for baby and children. A Women’s Journey Through Health workshop was organized by Feminine Magazine and Menarini at The Saujana Hotel & Resort Kuala Lumpur on 9th October, 2016. 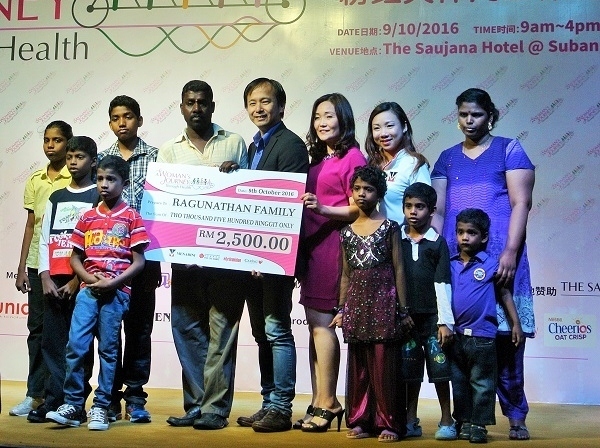 All ticket sales to the workshop (RM 25 each) will to be donated to the Ragunathan family with 11 children that suffer from financial problems. And hope that this will ease his family burden and provide a better for the whole family. Overall, A Women's Journey Through Health with Menarini was a very educational and interactive workshop. Not only we learnt so many things about our health and life journey but participated in so many fun and engaging activities. I hope that there will be more workshops like this to educate and empower women. yeah great to take time off to be there. good to know more on woman too! Great and informative event for women. I wish I can attend this. The talk had taught me to stay healthy always. Hopefully Menarini will held more talks in future for women like me. How lucky that you got to attend the workshop. It is so informative - thanks for sharing through your blog. Cheers to the share Kels -the workshop looks very informative :) Thumbs up! A very informative event !! I would like to join next..